Hello, I am new to the forum. My name is Gunnar. I live in Spring Valley, in Rockland County New York. I am very interested in purchasing a sunfish sailboat I saw in Orange County on Craigslist, but my current car (a Volvo S80) doesn't have a hitch to transport it. My question is, what cars, besides trucks and large SUVs, are good for towing? We are considering a Volvo XC70, an Audi Allroad, a Mercedes E-wagon, and maybe even a Toyota Sequoia. We don't want anything too over-the-top, and want something functional. What do you use to tow your sunfish? Welcome Gunnar, I regularly use a Honda Accord to tow my Sunfish and have no problem with it. The Sunfish is a light boat (around 130 lbs) so that's not going to be an issue with any car. The trailer could be, though I doubt it. I've towed Sunfish on small aluminum trailers with no trouble and larger aluminum boat trailers (larger tires, foot on tongue, etc) and had no trouble with them either. Recently I picked up a Sunfish which came with an old trailer made of iron (seriously) and it was the first time towing a 'fish, that I've even really felt the boat behind me and that was due only to the weight of this old-school trailer. You're generally gonna be ok getting a hitch/receiver installed on your current Volvo, I think, but you can always check the car's towing specs and the tongue weight of any trailer/boat you buy. I wouldn't get a new car just for this, just have a hitch/receiver installed, but if you do, any of the vehicles you mentioned will do fine. Gunnar- due to the weight and shape of a Sunfish, you don't want to be towing it with just any old car. You need a vehicle with at least four cylinders, and more than about 20 hp or so. If you are thinking about using a Trabant, a Renault R4, a BMW Isetta, or maybe a Citroen CV2 you might want to consider upgrading a bit to at least an early VW Beetle, which had a nice sturdy 40hp. The OTHER thing you want to keep in mind is control of the trailer whilst going down the road. For this, you certainly want 4 wheels..... which means if you want to use an old Morgan Three Wheeler, or a Robin Reliant you might want to reconsider. That being said however, I have seen a Sunfish going down the road being towed by a Vespa.... so two wheels might be ok.
My personal favorite Sunfish transporter of all time was a 1969 Opel Cadet station wagon with a roof rack, and simulated plastic woodgrain on the sides. It carted my boat around for almost a decade before 2nd gear went out. THAT was a real tragedy. Have you ever tried to get an Opel Cadet's transmission repaired on the Gulf Coast of Alabama? No, I bet not.... or you wouldn't be laughing about it. So.... here's my serious recommendation: unless you drive one of the "not recommended cars" listed above, just put a hitch on whatever you already own, and go have fun. (or put the boat on the roof) BUT if you really want to look cool, go one step better and buy some neat old car like my old Opel Cadet, or maybe a Pinto Station Wagon. Then paint the car and boat to match in some wild color scheme.... and go in STYLE! However.... if you are actually looking for an excuse to ditch the Volvo, then here's an alternative ending: "That puny Volvo won't work at all. You actually need a Jeep Wrangler with the heavy duty package, big tires, and a monstrous crash bar on the front. With such a rig, you can get your boat to any body of water on the continent! " Talk to the dealership and U-Haul to see if a hitch can be installed. I had a Rabbit in the early 80s and it easily towed a two boat trailer (with two Sunfish on it) from Boston to Chicago, Buffalo and Alabama. So if you are looking for an excuse to ditch the Volvo, the "I need to tow a Sunfish" excuse is not going to work! U-Haul did mine and is was reasonably priced. You can't tow a Sunfish with a 1987 Corvette. HOWEVER.... the manual does not say you can't put the Sunfish on the roof. That might be OK. (I'm not sure about other year Vettes since I only have the 1987 manual.)" A Florida friend "flat-towed" a Porsche 911 to races and autocrosses. Asked: Why tow with your Corvette?" He answered "Great air-conditioning and stereo". As for myself, I towed my Porsche 914/6 behind my 1971 VW Westphalia Camper. Nobody ever asked me why. But I would have said, once you've made a "hole through the wind" with the VW camper, you won't notice anything towed behind you. I only startled myself when looking in the rearview mirror to see a black car's roof right behind me! Braking was another matter entirely! No pix of the cars, but a 20-foot Tornado catamaran is "light" at 500 pounds. Here's my Tornado (and steel trailer) towed behind a 40-HP air-cooled VW engine from Miami to New Hampshire. To comply with US towing laws, the Tornado's 10-foot beam requires that the trailer hold the catamaran angled and within an 8-foot width. My tow vehicle is a 2004 Mini Cooper, (in my avatar). It hauls my galvanized steel boat trailer without any problems. If you live close to the water and have a Fiat 850 Spider, you can balance the bow on the top of the windshield and have one or two friends walking behind holding up the stern as you drive in 1st gear. The windshield won't crack if done properly. Who needs a trailer? All you need is a Corvair. The XC70 would be nice, it has a roof rack. Saw one recently with a nice kayak on it, room for daggerboard and rudder in back. We use the Grand Caravan as it has lots o space for gear. I second the suggestion to call UHaul and ask if a hitch can be installed on your car. The trailer (? lbs) and boat (130-140) will certainly be less than 500 pounds total. PS I nominate Blue Heron's post as the Most Informative Post Of The Year. I used to tow my first Sunfish behind a '77 Corolla, including putting in at a boat ramp. It doesn't take much of a vehicle to do the job. So far there has been a lot said about the types of cars that can and cannot tow a Sunfish. What these responses have not considered is the signal you send with your tow car. For instance, towing a car with an old Corolla says something very different than towing it with a new Audi Allroad. Gunnar, you'll want to decide what type of statement you want to make with the tow car. The Mercedes E-Wagon? You are a country squire (not the old Ford wagon, I mean YOU are the country squire.) You are the king of the suburbs, an executive to be reckoned with. The AllRoad - an upscale woodsy type - you are what Subaru Outback owners aspire to be. The Sequoia? You are unstoppable - a superman of a man. You'll want to reflect on the image you want to present, and maybe check with a few friends for their perspective on what image a car you are considering will project. All of the tow vehicles you are considering project an aura of success. So please be sure the Sunfish you buy is in fine shape and a suitable companion to your car. You don't want the condition of your car to outshine your boat, and visa versa. Good luck - it is important to get this decision right. Hmmm... I've got a 2006 Subaru Forester with 160k miles towing a Sunfish missing the coaming and rub rail which is in desperate need of a paint job. I wonder what image I'm projecting??!! I put a lot of thought into the image you are projecting. I was initially thinking with the Forester and the somewhat downtrodden Sunfish that you were projecting that you are a Sierra Club member, but that of course was not nautical, which was bothering me. I finally determined that you are projecting that you are a Greenpeace supporter. wow HiluL.... I think you put into words exactly what I was thinking. I guess the BIG question is whether or not his Sunfish has a big whale painted on it. 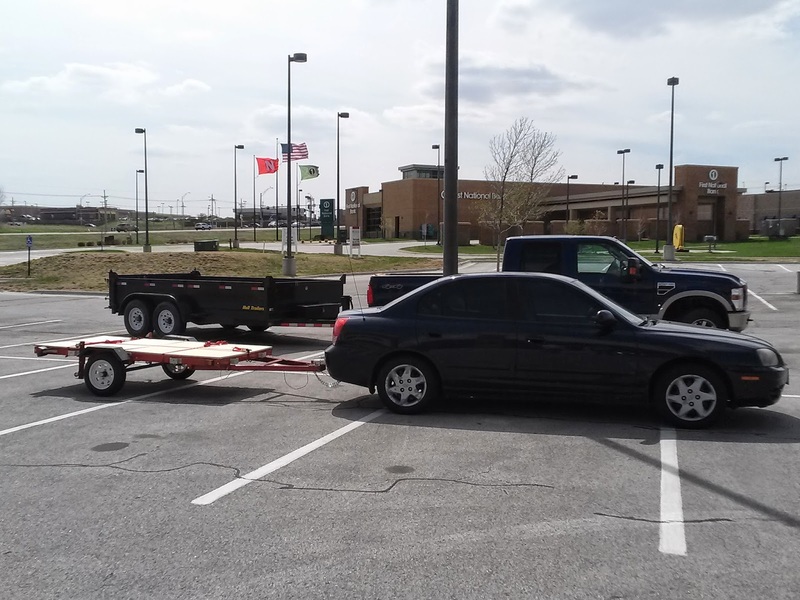 Keep the car....get a hitch and trailer....good to go. The guys I sail with make fun of me for pulling my Sunfish with a full size truck (this is Texas). I drive a Honda Fit, and would tow with it, but I'm still paying for it and it would void the warranty. I will say that I cannot see any part of the boat or trailer when I'm pulling it with the truck, so that might be something to think about. At the top of the list are a few vehicles, the most impressive example of which was driven by one of my heros, a Sunfish legend and occasional contributor to this board (and, not to name names or anything, the author of The Sunfish Book portion of The Sunfish Bible). It was a spartan utility van, commercial looking with few windows. It had a bunk inside constructed of two-by-fours and plywood, with plenty of room for gear. I was in the parking lot at an event years ago, like everyone else noticing it out of the corner of my eye when a Sunfish world champion walked over, looked inside and commented to the owner something like “this is one serious sailing van.” If you want to inspire awe in a host club parking lot, a serious utility van outfitted like this will do the trick. Next up is the Volvo station wagon. It almost doesn’t matter the model or year, as long as it’s sufficiently boxy. Numerous sailing legends have used these, as well as other sailing fashion influencers, including the internet’s most prolific ex-Sunfishing sailing blogger. These are hugely popular among those in the know, including at the best yacht clubs across New England (the Gulf and particularly Texas has its own version of the Volvo wagon: the older full-size pick-up with cheap-looking bed cap). Volvos always have the padded Thule racks, while the Texas pick-up cab racks are always home-made. You still tow the boats, but racks are obligatory. The key with both the Volvo and the capped pick-up bed is that they have to look like you’ve been living out of the back for a long time. A sleeping bag, tossed underwear, some moldy sailing tops, mismatched sailing gloves and really foul boots make good accessories. The other thing is, since both of these vehicles have too much glass in back for privacy, the rear side windows need to be covered in stickers. The “I’d rather be sailing” stickers are fine for casual sailors, but the serious vehicles must have at a minimum some US Sailing stickers and blue/white North Sails stickers. Beyond that, go to town. A prominent Sunfish dealer in your state is renowned for his creativity in the world of stickers. You see his stickers pasted even on Sunfish rudder straps, spars, extensions, everything (fortunately his talented wife does the art-work). If you run short of stickers for complete window coverage, just pay him a visit and ask for suggestions. As you get looking you will see that there is even a hierarchy in stickers, and the rule is, go for a combination of in-the-know local, and down-under-logo stickers. For example, along with usual APS, Harken, Musto, and Ronstan stickers, I might include some IntensitySails and New England Ropes as well as those highly desirable Rooster and Zhik logo stickers, and any other of the latest Aussie or NZ brands (which of course will command the can’t-miss-these window locations). Moving on, one of the more under-rated stealth vehicles is a generic minivan, a Dodge Caravan or equivalent Japanese model. Those in the know, know when you see one of those pulling up, especially if it’s pulling an overloaded Sietech trailer or similar custom arrangement, the driver will likely be going home with the largest share of the silver. Another category to watch for is the custom 'sailing' or Sunfish vanity license plate on an otherwise innocuous vehicle. Especially in the northeast, if you see these they are as often as not driven by a sailing class icon. They may not still be top finishers, but if the driver is beyond middle age it is good form to always pay your respects (the Texas equivalent to this is the full-size Sunfish logo tattoo). Next on the list is the compact hatchback, and the only rule here is that a Sunfish, if carried on the roof, overhangs both ends. In a few years the Honda Fit will be perfect, and by then that never-washed wet gear will have aged enough so others setting up nearby will nod with respect. A last word – and I truly hope I don’t offend a single reader here - if there is one vehicle you will want to be wary of, it’s the late-modeled USSailing-logoed black Suburban (and Yukon, etc). Especially in big-time sailing locales. There will be a good chance that the driver is actually not a sailor but a Mommy-boat skipper or similar personage. Unless you know them personally, it’s best to use caution. And if the driver appears to be under-age, there is still a good chance that he or she is the favored child of a Mommy-boat skipper. If you are thinking about picking up one of these Suburbans for sailing, wait at least until they are a couple of decades old, or you might find some sailors avoiding the vehicle. The list continues of course, but hopefully this will get you started. Um, I have a 02 Tahoe. Should I be offended?